You know its a tough day when you start dreaming of bed time before noon. That’s the kind of day we were having. We’ve had two weeks of sickness (no one warned me that having two kids ensured that when one gets sick, the other will immediately follow) which means a lot of time in the house. 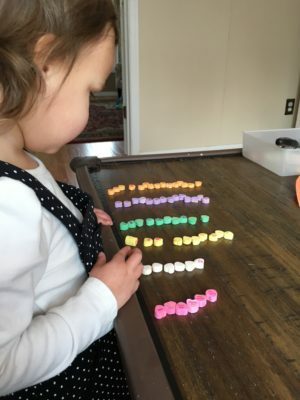 To top it off winter decided to show up here, and its like ten degrees outside – ain’t nobody got time for that, instead let’s learn with candy hearts. If the cold and sickness wasn’t enough, Layla discovered Daniel Tiger while she was sick – and I was going to throw myself from a window if she asked me on more time to watch it. I needed activity intervention and fast. I had to run to the drug store anyway, so while I was there I grabbed a bag of candy hearts– I could figure out something to do with these right? My favorite part about these candies…I’m not going to be tempted to eat them all when we’re done our activity. Does anyone actually like the taste of these? It might just be the only “candy” item that I’ll politely decline. Bonus points for the fact that Layla didn’t even identify these as candy or any sort of edible item, so there was no nagging me for them! 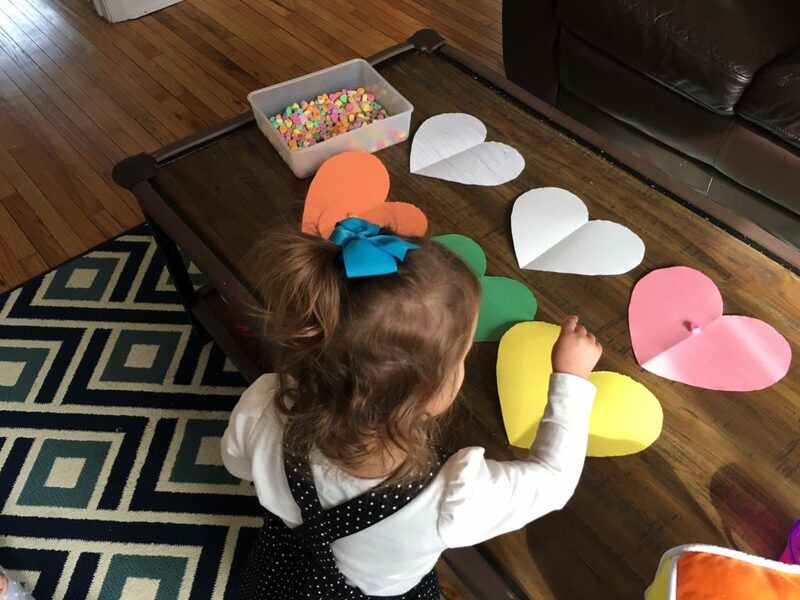 Empty your candy hearts into a large container, and allow your child to sort them by color. Use various kitchen utensils to move hearts from one container to another. For Layla (2 years old) we used tongs and a large spoon. For Olivia (7 months old) we just stuck to challenging her to pick up single pieces of candy with her fingers. If you are doing this activity with a baby KNOW YOUR CHILD! Olivia puts everything in her mouth, so this activity didn’t last long for her, and while it did I had to watch her like a hawk. 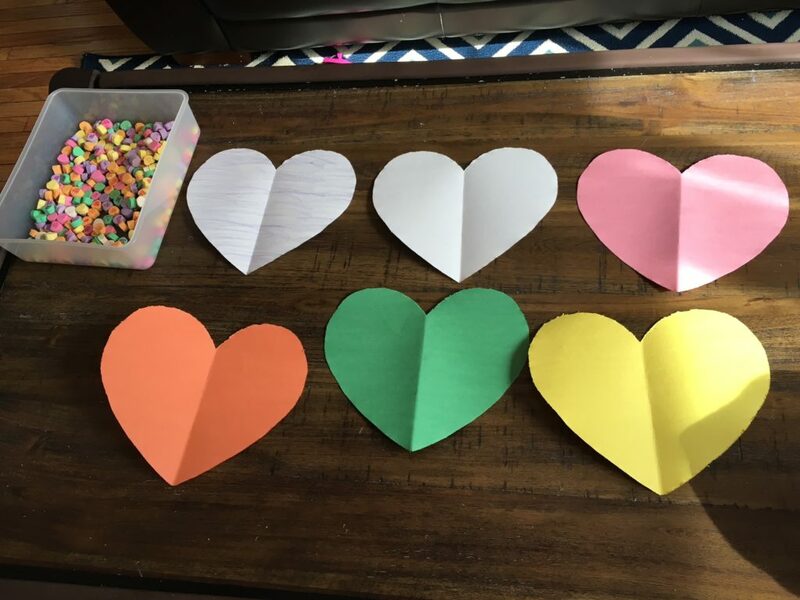 Use these hearts alone, or with others items to create a sensory bin. Add pom-poms, various wrapped candies, other heart shaped items, rice etc. These candies are LOUD, so they work well for making some fantastic (albeit annoying) instruments. Place your candies into a sealed tupperware container and have at it! The girls both had a blast shaking the containers, as well as banging them like drums. I know you think I’m nuts, but this went shockingly well with Layla, and I’d recommended it for any kids ages 2+. 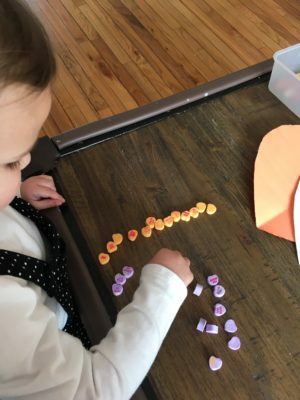 Take a big scoop of your candy and have your child line the candies up according to color (another great fine motor skill). This does not need to be perfect, as this is obviously a very introductory lesson to graphing. Once the candies are lined up you can ask your child questions like which one has a lot, or the MOST candy? Which one only has some candy or the FEWEST? Never hurts to throw that math vocabulary in there at an early age. Oh these are such great ideas! My son loved sorting skittles last year around St. Patrick’s Day. I’m sure he would love to sort candy hearts. I didn’t even get around to buying anything though! Valentine’s day just snuck up on us this year. Ha-they’re one of the only candies I’ll decline too. These ideas are great! I think my kiddos would love all of them. Such a cute idea! Candy hearts are great for so many things. We use them for a stacking contest on Valentine’s Day, and just to build towers with, too. What a fun way to use candy to learn. I was just at the store today and they had Conversation Hearts on clearance for 18 cents! Maybe I’ll grab some and we can enjoy your ideas! This is so cool! I never thought of doing these things with candy hearts! 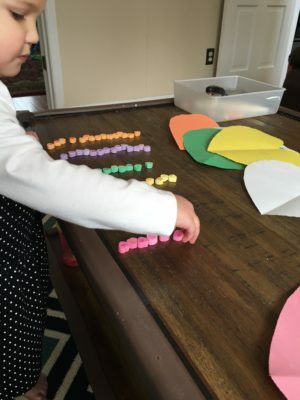 What fun ways to learn with candy hearts. The kids sure do look like they are having fun! I love that you did graphing! That is a great idea. 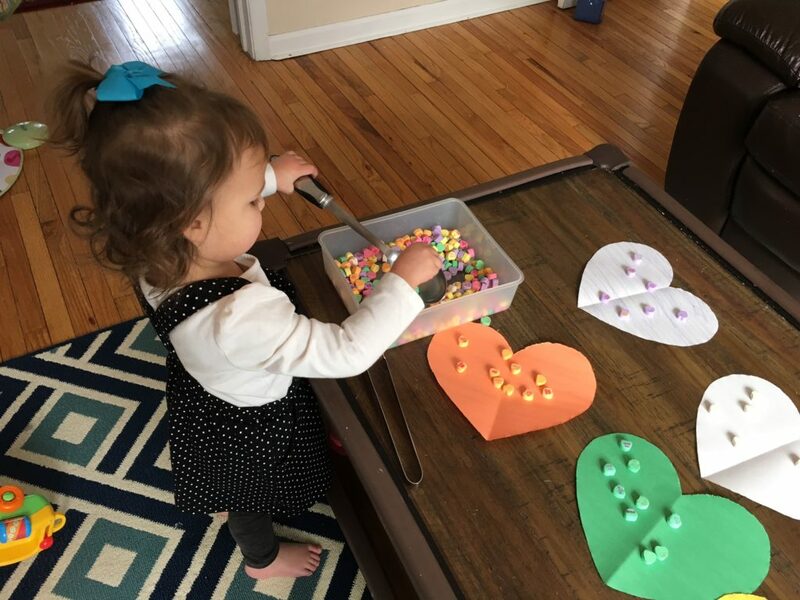 Wow, who would have thought you could do so much with those candy hearts! Great post, I love these ideas!